Steve Griffin | The Salt Lake Tribune Gov. 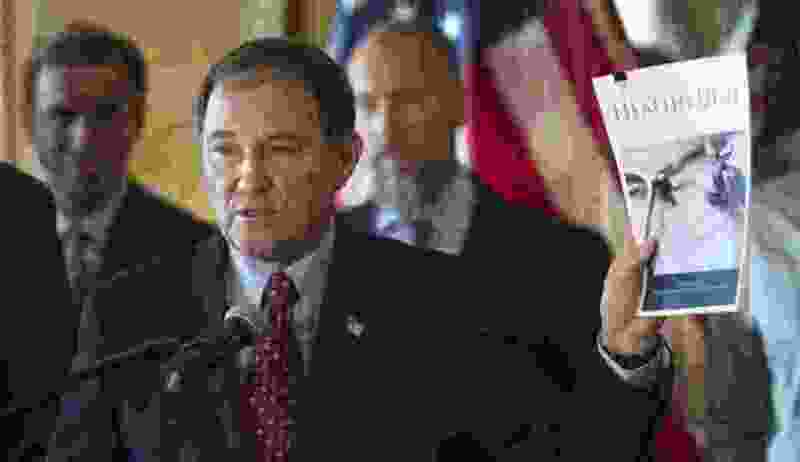 Gary Herbert addresses the media as he releases his detailed Healthy Utah plan, which is an alternative way to expanding health care coverage for the poor without technically expanding Medicaid. The plan was hammered out in months of negotiation this year with the U.S. Department of Health and Human Services. 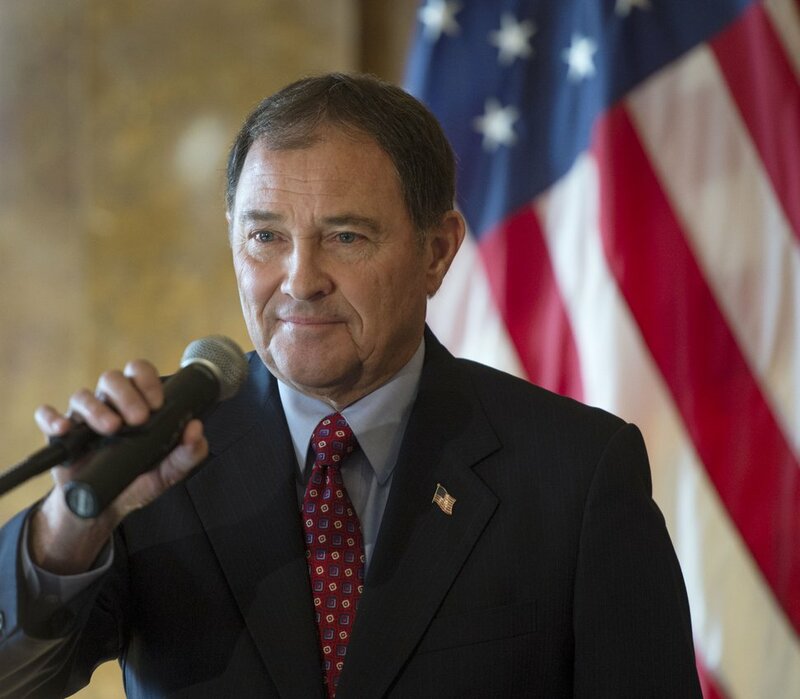 He was joined in the Gold Room at the Utah State Capitol by city and state leaders in Salt Lake City, Thursday, December 4, 2014. Utah lawmakers dealt a setback to the governor's Healthy Utah alternative to expanding Medicaid Thursday. The Legislature's Health Reform Task Force chose not to recommend the plan to the full Legislature, instead picking two other options to cover many fewer Utahns, and only if they are "medically vulnerable." Rep. Jim Dunnigan, R-Taylorsville, called it a "good, measured approach." Dunnigan is co-chairman of the task force and proposed recommending options that would cover between 12.5 percent and 20 percent of those below the federal poverty line — but only those who are mentally ill, addicted, disabled or too sick to work. Both options would provide health care for a fraction of those who would be covered under Healthy Utah. "If it works, we can always advance it further and cover more," Dunnigan said, winning the votes of the Republicans on the task force who said they worry about the long-term costs of extending Medicaid benefits. The move surprised and disappointed the governor's point man on Medicaid expansion, David Patton, executive director of the Utah Department of Health. "They're being shortsighted," said Patton, noting that the task force's options are much more costly than the governor's plan for six years and they would cover much fewer people. The task force's proposal to cover only some medically vulnerable or frail people "is really not vetted," Patton said. "It's not thought through yet." Patton said he's still optimistic that the full Legislature will embrace Healthy Utah, which he described as the most financially responsible plan, and one that would cover the highest number of the poor. Sen. Brian Shiozawa, R-Cottonwood Heights, a physician, was surprised by the vote. He and Democrats on the task force had wanted Healthy Utah to be among the recommended options. He said the task force's recommendations defy logic because they are more expensive for several years and cover far fewer people than Healthy Utah would. It's going to be a rough road for the governor's plan, Shiozawa said, given the lack of support from Dunnigan, who is considered the key lawmaker on health care reform. Dunnigan, who accompanied Herbert to Washington two times as the governor negotiated with the U.S. Department of Health and Human Services, blasted the feds for not allowing a higher match rate if the state expands Medicaid only to those whose incomes are at or below poverty levels. By agreeing to expand coverage to those up to 138 percent of poverty, the governor was assured a higher match from the feds. It starts at 100 percent and drops to 90 percent in 2020 and beyond. Under Dunnigan's options, the federal government would pay 70 percent, which is the current match rate. Dunnigan called the Affordable Care Act a "convoluted scheme" that the feds are foisting on Utah. "If they (the federal government) want to really cover people, who don't they give us the enhanced match?" he said. Under the task force's recommended Option 1, 10,300 medically frail people below the poverty level would be covered at a cost to the state of $28 million in 2021, Dunnigan said. Option 2 would cover 15,900 medically frail people below the poverty level for a cost of $40 million to the state in 2021, he said. Healthy Utah would cover 146,000 people who earn less than 138 percent of poverty, at a cost to Utah of $78 million in 2021. The higher federal match and healthier population makes the per-person cost much lower. Nate Checketts, health reform coordinator for the health department, questioned Dunnigan's cost estimates for the task force's options because they are based on an analyst's review of Healthy Utah. The governor's plan would place the medically frail in Medicaid's affordable care organizations. Dunnigan said under the task force's options, the medically frail would be covered by private health plans. The lawmaker's cost estimates don't reflect the higher cost of doing that, said Lincoln Nehring, an analyst with Voices for Utah Children. Because it would be more expensive for private insurers to cover the medically frail, "They will have to increase premiums on everyone else," Nehring predicted. Moreover, he said, it makes little sense to consider those who are medically frail more "needy" than the working poor, he said. Under the task force options, "The single working mom with children can't get coverage while the heroin addict coming out of jail can," he said. At 14, Savannah Ostler started writing her first screenplay. 15 years later, her Utah-made ‘Twice the Dream’ is opening in theaters.